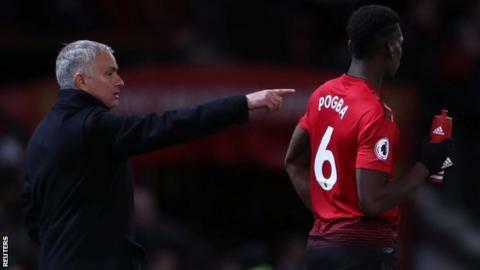 Paul Pogba will "show everyone how good he is" in Manchester United's Champions League game against Valencia on Wednesday, says manager Jose Mourinho. World Cup-winning midfielder Pogba, who rejoined United for £89m in 2016, was an unused substitute in Saturday's 4-1 defeat of Fulham, the second successive game he has started on the bench. But Mourinho said he would start in Spain. "He has the potential to be a fantastic player," said the Portuguese. "Against Valencia he is going to start and he is going to have a fantastic game and to show everyone how good he is." United, second in Group H, are already assured of a place in the last 16. Mourinho and Pogba have appeared to be at odds for much of the season, with an awkward training ground exchange between the two caught on camera in September. Asked about Pogba following the win against Fulham at Old Trafford, Mourinho said: "He has to play with the same mentality as the team is playing." Earlier, when describing how United had managed to end a four-game winless run in the Premier League, the manager said to BBC Sport: "When you give everything for the club, you are closer to being a better team." Prior to the match, Mourinho denied his players were not giving their all for him. On Saturday, he said: "You always have to be a good professional, to give everything for the club - not, like people like to say, the manager. It is for the club. "The players understand that when we have 11 sticking together, fighting together, working together as a unit, we can be a much better team."